Josh Lambert may have gone into the astral plane world of “The Further” to save his son in “Insidious,” but something isn’t done with him or his family just yet. We know this because the first creepy trailer for James Wan’s Insidious: Chapter 2 tells us so. Starting off well enough with a happy household, it quickly devolves into a nightmare for the family as unexplained phenomenon begin and ghostly figures manifest themselves again. Just from these two-minutes it is clear Wan and writer Leigh Whannell have recaptured the dreaded atmosphere they created in the 2010 original. See for yourself by watching in the embedded video! Insidious: Chapter 2 stars Rose Byrne, Patrick Wilson, Barbara Hershey, Ty Simpkins, Lin Shaye and Leigh Whannell. Insidious: Chapter 2 chills US and UK theaters on September 13, 2013. Looks like every other paranormal movie these days. 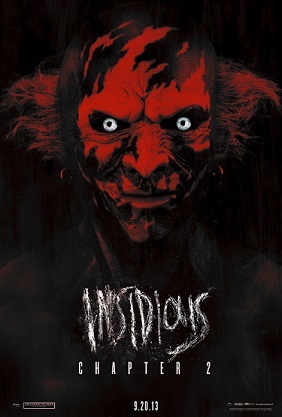 I liked Insidious, so I’ll definately see this. The dice rolled “MATER MORTIS” Anyone know what that means? Something along the lines of “Mother Death”. Might be referring to the haggard ghoul woman that inhabited Josh when he returned from the netherworld. Sounds like a reasonable explanation. I didn’t think the first one was anthing frightnening so I’ll take a pass..